Barbara has many years of experience in baroque dance, both as performer and choreographer, as well as teacher. She has taught in Europe, the Baltic Countries and Australia, in addition to courses in the UK. Her approach to baroque dance teaching is to exploit the theatrical aspects -- to make the dances come alive as if part of a real drama. As well as dance, she has given courses in baroque gesture for singers. 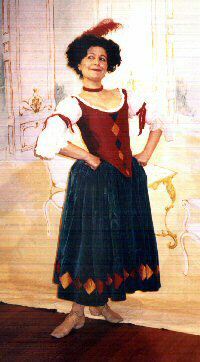 Early ballet training was interrupted by university, but after completing post-graduate studies at London University (she holds a PhD in Psychology from London University, LSE), she resumed her life-long interest in dance, with studies of the Baroque and Renaissance repertoires at the Guildhall School of Music and Drama. She has also studied with Irene Ginger and Francine Lancelot in Paris and with Angene Feves in the USA. In 1985 she formed the company Contretemps, specialising in the reconstruction of 18th century dance theatre. With Sara Stowe and Matthew Spring (of Sirinu) she formed Chalemie in 1995 with the aim of extending this work to a wider audience and with a more varied repertoire. She has performed and taught (both dance and baroque gesture) throughout Europe, the Baltic States and Australia, as well as at many festivals, stately homes and theatres in the UK. She has collaborated with and toured for the Early Music Network and the British Council. She has taught early dance on the BA (Hons) degree in Ballet Education at the Royal Academy of Dance in London. In addition to her work with Contretemps, she is a frequent performer with other groups, both in the UK and abroad. She was a founder member of the European Early Dance Company, based in Berlin, and was co-choreographer and performer in their reconstruction of the Mozart ballet “Les Petit Riens”. She choreographed and danced in Purcell’s “The Fairy Queen” in Riga (a project organised by the Riga Early Music Centre). She has performed with many early music ensembles, including the New London Consort, Tragicomedia, Midsummer Opera, Cambridge Handel Opera Group, Rejouissance, Sirinu and Collegium Musicum Riga. With her group Contretemps she staged small scale entertainments of dance, song, and commedia for visitors to Hampton Court. She was also involved for 5 years in work for a company specialising in historical reconstructions for the Royal Palaces. This involved the choreographing of period recreations of social dances from the 17th and 18th centuries. She has also acted as advisor to several theatre groups requiring choreography for period plays, and has choreographed for films on TV. Barbara holds regular workshops in baroque dance - both beginners/elementary and intermediate/advanced, on Sundays in central London, as well as a Beginners/Elementary class every second Monday in Winchester.